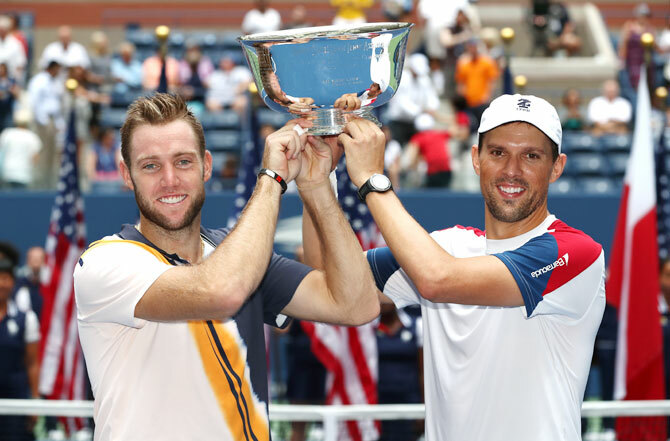 American Mike Bryan claimed a record 18th Grand Slam men's doubles title when he and compatriot Jack Sock beat Lukasz Kubot and Marcelo Melo 6-3, 6-1 in the U.S. Open final on Friday. The meeting between the last two Wimbledon champions proved one-sided as Poland's Kubot and Brazil's Melo, seeded seventh, had no answer for the tactical game deployed by the third-seeded American duo. With the win the Americans became the first team to win consecutive Grand Slam titles since Bryan and his twin brother Bob, who has been sidelined with a hip injury, swept four straight starting at the 2012 US Open. "This is not just about me. It's a team effort," said Bryan. "Takes a lot of people behind the scenes to get this 40-year-old body on the court and winning a couple matches."